life. Like the original wunderkammer or Renaissance studiolo, this collection is situated within an implied architectural setting. It is a retreat, a study and a place of reverence. Here the collector can contemplate the luxuriance of nature, a true garden of delights. But this is nature at it exists today. The faux-stained glass windows around the periphery of the gallery contain Tiffany-like landscapes featuring specimens of extinct and endangered specimens. “Trees” are created from aerial views of cul-de-sac neighborhoods and electrical power lines, and track housing falls from the sky. In the room, an audio work plays bird songs and other nature sounds that are gradually overpowered by the cacophony of urban traffic and construction. 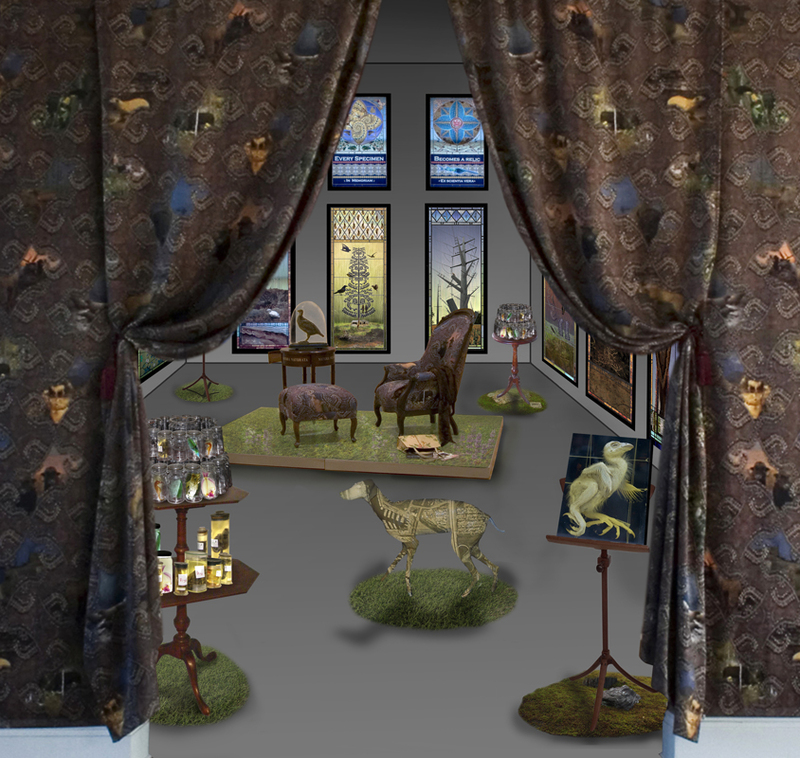 The installation merges the history of decorative design with the culture of collecting within natural history museum. It combines research in often playful aesthetic, to critique and juxtapose the idealized, market driven environment of the shopping mall and suburban development with disappearing native ecologies, in a manner that is poetically subversive. Nature is increasingly only encountered through secondary sources. Very little experience comes from direct observation. Instead, we are voyeurs streaming nature on smart phones, posting on Facebook and 'friending' museums and zoos. Most of what is learned about the natural world is processed and transformed into something that can be acquired, purchased online, and placed on a knick-knack shelf. In On Photography (1977), Susan Sontag noted, “Nature in America has always been suspect, on the defensive, cannibalized by progress. In America, every specimen becomes a relic.” Today, there is no part of the world that can escape human impact through either direct or remote contact. Even the most isolated sites are altered by climate change and migrating pollution. But there are also the stories of recovery. The peregrine falcon portrayed in one of the central panels was on the verge of extinction 25 years ago, but has rebounded and is no longer listed as threatened. So the installation asks the viewer to reflect on how we can live with nature, foster and nurture bio-diversity, heal the environment. And in doing so, ensure our own survival.